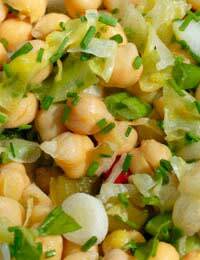 Chickpea is one of the most overlooked salad ingredients, yet it can be used to make healthy and delicious salads. The chickpea is widely used in countries such as Spain and Italy and both tinned or dried chickpeas can be used to make your chickpea salad. First take the chickpeas that have been soaked overnight and drain them of all excess water. Next take the whole clove of garlic and place it, with the drained chickpeas, in a large saucepan. Once you have done this cover both the chickpeas and garlic clove in plenty of water and bring the water to the boil. The chickpeas and garlic should then be cooked at a medium heat for between 1 hour and 45 minutes and 2 hours and 15 minutes. You should ensure that the saucepan is uncovered during cooking. By this time the chickpeas should be tender and you can use the salt to season them. Once you have completed this stage remove the chickpeas from the pan of water and drain them of excess water. Next you need to take the chickpeas and mix well with the remaining parsley, garlic, chilli, onion, wine vinegar, cucumber, coriander and mint. Once the ingredients have been well mixed together you can season your chickpea salad with salt and pepper before serving. To add variety to your chickpea salad recipe you can add pitta bread and feta cheese. First take the pitta breads and after cutting them in half, so the inside is opened up, lightly coat the pita breads with a mix of olive oil and paprika before baking at around 160 degrees C for approximately 8 minutes. By this time the pitta bread should have a light brown appearance. Next fry the onion, garlic and chilli in a frying pan of olive oil, starting with the onion for approximately 4 minutes before adding the other ingredients for approximately 2 minutes. Next take the warm chickpeas and place in a bowl before adding some feta cheese, ensuring that it is mixed well together. The pitta bread can either be used as a crunchy base for the salad or be used as a side dish to go with your chickpea salad. Chickpea salad is ideal for adding your own favourite ingredients. These can include lots of different spices, chorizo sausages and sun dried tomatoes.